These are the perfect little morsels to tuck into a BLT, or a Caesar Salad. Anywhere delicious smoky saltiness is warranted! The perfect slice has varying textures from crisp and browned in some spots, to tender and chewy in others. To that end, hand slice these babies instead of using a mandoline and aim for 1/8 inch slices, but don’t worry about perfection. The varying degrees of thickness will work to your advantage here. Just don’t get too thick, the eggplant needs to crisp up and slices that are much thicker will just get soggy. This recipe is so easy you’ll be making eggplant bacon in your sleep! It was originally published in Appetite For Reduction, but this version is doubled. If you don’t feel like dealing with two pans, feel free to half the recipe. Preheat oven to 425 F. Line 2 large baking sheets with parchment paper. Prep the eggplant while the oven is preheating. Eggplants vary in size, so if using baby eggplant that is 2 inches wide at its widest, just slice into 1/8 inch thick circles. If using large eggplants, first cut in half lengthwise, then slice the halves into 1/8 inch thick halfmoons. Now what we’re going to do is bake it at a high temperature with just a bit of cooking spray oil, then let it cool, then give it smoky salty flavor and reheat. Cover baking sheets in parchment paper and spray lightly with cooking spray. Arrange eggplant pieces in a single layer and spray lightly once more. Place in oven and bake for about 8 minutes, keeping a close eye. Rotate pans about halfway through baking. Remove from oven and flip slices. They should be browning already, and if any are slightly burnt, don’t worry. Just move them to a plate to cool. Return remaining strips to the oven for about 3 minutes. Remove from oven. Eggplant should be dark brown to burnt in some places, and yellowish white and tender in some places. Transfer to a plate to prevent further baking. Lower oven to 350 F. Mix soy sauce and liquid smoke together in a large bowl. Dip eggplant slices in mixture a few at a time and return to the baking sheet. Bake for about 3 more minutes, until heated through. Serve! Keeps well for a few more hours, but definitely use these the day of. This is a much simpler recipe for eggplant bacon than others I’ve seen. Will have to give this a try soon! Mmmm a nice simple way to get more eggplant in my life! Hi! I love your recipes! This is a lovely way to eat eggplant (I love eggplant, real love..)! I’m going to try it soon! Such a great idea! I love eggplant in all forms! This looks really good! I was just wondering–would it be a good idea to sweat the eggplant slices first? Nope, totally not necessary. I think they would actually disintegrate into nothing if you tried. I LOVE eggplant yes I do, I love eggplant you do too!!!!!!!! First eggplant bacon recipe that actually looks easy and delish. Amazing. I harbor such eggplant fears, but this recipe may be destined to vanquish them. Thanks for posting. Can you freeze these (maybe vacuum seal them to keep them fresher)? I’d love to make a large batch and have them at the ready for sandwiches, or at-the-ready to make your latest yummy Scalloped Potatoes and Eggplant Bacon dish. They are so fragile, I think they would just turn to nothing if you reheated them. You can keep in the fridge and they won’t go bad, but they will get soggy. They’ll still taste good, though! Do you have a print gadget I’m not seeing?? Yes, but it’s kind of messed up. Best to just copy and paste in a doc. It’s on my to-do list to get that fixed. Would it be possible to use zucchini instead of eggplant? I added 2 tsp of maple syrup & really liked the addition of the maple-y taste & caramelization. This looks delicious! 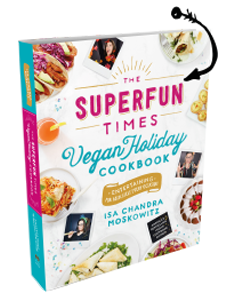 I’m new to the vegan world and am wondering.. where do I find liquid smoke and is there anything I might already have that I could substitute for it? Liquid smoke is usually with the condiments in most supermarkets. Often next to BBQ sauce, vinegars, etc. There are a few other ways to get smokiness without a smoker, such as smoked salt and smoked paprika. I think smoked paprika might be a good choice, but then you’d obviously be adding a paprika flavor to the eggplant. I loved this stuff! I had to cook it for a lot longer to get it browned. Maybe I Sliced it too thick? But it was still delicious! I liked these, but mine were really salty even though I used low sodium soy sauce. I will cut way back on that next time. i had to cook for quite a while to get mine crispy…i had to resort to the broiler on low at the end. i know i didn’t cut them too thick…perhaps it was the fact i was trying to use up an old-ish eggplant…? i also added a touch of some sweet potato hot sauce. that kicked it up quite a bit! In cooking school we made mushroom bacon… basically toss thinly sliced shittake mushrooms (or portobello/button whatever you have) with a bit of olive oil s&p and roast in the oven till just crisp. They don’t need anything to make the flavor insanely delicious and bacon like! Perfect for ceaser salad or anything really! What brand of liquid smoke do you recommed? So i keep trying these and can’t seem to get it right. As delicious as they taste, they’re soggy and not crisp at all. I haven’t been using the parchment paper. Would that make a difference? The slices are definitely thin enough. What are the best supplements for a vegetarian to take? Try these on pizza. Oh my gosh oh my gosh oh my gosh. I’m going to try putting these slices in my dehydrator instead of the oven. 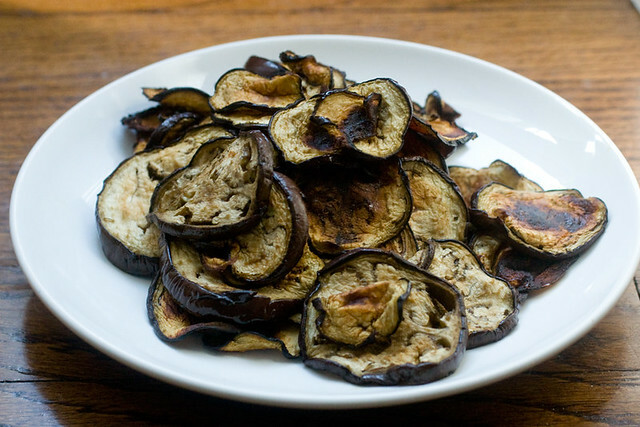 It’s how I make eggplant chips anyway, but I usually use just a sprinkle of salt. I bet this would make them even better! I have been looking for liquid smoke for years does anyone know where to get it? Would smoked salt instead of soy sauce + liquid smoke work instead? You can mix 1/3 teaspoon of smoked paprika with 1 teaspoon of hot water to make a teaspoon of liquid smoke substitute. I would also add a 1/4 teaspoon of tarragon, 1 teaspoon of maple syrup or dark agave to the 1/4 of soy sauce. I found the liquid smoke in the meat section of a fairly fancy pants grocery store. It was 5 cups for a smallish bottle (i guess its not that small give how much you use per recipe…). Why not marinate the eggplant and then bake it? Wouldn’t that save some time? thanks for the recipe, it looks easy and delicious! This is so good that I have made it twice in a week. I made a bunch the second time, put the leftovers in the fridge and heated them in a hot cast iron pan. They were very good that way, too. I used this ‘bacon” in a tasty Mediterranean sandwich. I roasted sliced zucchini and red pepper at the same time as the eggplant and then layered them all on a slice of bread slathered with some hummus. Like others have said I had to keep the eggplant in for much longer to get it browned and it came out too salty for my taste. Layering it together with the plain zucchini and sweet pepper helped even it out and the result was absolutely delicious! Brushing on the tamari mixture (rather than dipping the slices in it) keeps them crispier. Hi, What are your thoughts on liquid smoke? I have heard some kinds are carcinogenic. I have some nice alder smoked salt which I used from time to time and it’s nice.. Thanks for everything! Mushroom, Fetta, Sausage and Eggplant Bacon Pizza | That's Good Eatin'! Just tried this today, without liquid smoke, and it was awesome!! Can’t get liquid smoke, but I have got smoked salt. Any tips for making fake bacon with it? I served these with Mac Daddy and all my shorties agree: “Not bad Ms Chandra, not bad at’tal.” I had a diner-style squeeze bottle that I used to distribute the smoky soy with. I just made this and it was amazing!! So much better than the real thing – no living creatures harmed and no clogged arteries. 🙂 BTW, people who were curious about liquid smoke and brands – I used Colgin liquid smoke. According to the label and website, there are no animal byproducts used and it’s gluten free. I found it with the BBQ sauces at my local grocery store. Thanks again Isa!! Making this recipe for the second time ☺️ I can’t do liquid smoke (gives me indigestion) so I substitute smoke paprika instead. I add some maple syrup to Braggs liquid aminos and just a little cumin. This is delicious! Beware though of spraying too much oil as the eggplant will take longer to get crispy. I just made this for the first time and couldn’t help myself- I added 2 T of maple syrup to the eggplant schmear. Despite my altruistic intention of bringing it to work to share with my awesome and very deserving coworkers, I inhaled the entire eggplant, in the form of an ELT, with sunflower sprouts instead of L, and corn tortilla instead of bread, myself. I’ll take my penance of having to make it again, very soon. Where has this recipe been all my life???? This looks good but is in no way even resembles bacon. Scrambled Tofu and Eggplant Bacon Breakfast Tacos | That's Good Eatin'! Labna and Rocket Pesto Breakfast Pizza | That's Good Eatin'! My eggplant bacon had an aftertaste,despite all the seasonings.Should I have salted the pieces first to get bitterness out? Despite great seasonings,mine had an after taste. Should the slices be pre salted prior to marinating?